(Bloomberg) -- Abu Dhabi is considering combining Abu Dhabi Islamic Bank PJSC with First Abu Dhabi Bank PJSC to create the Middle East’s largest lender, according to people with knowledge of the matter. The emirate plans to wait for a three-way combination of Abu Dhabi Commercial Bank PJSC, Union National Bank PJSC and Al Hilal Bank to close before starting fresh talks to condense the finance industry further, the people said, asking not to be identified as the talks are private. Deliberations about a potential combination are in early stages and is being currently being discussed at the shareholder level of both banks, the people said. The banks have not formally appointed advisers, and discussions may not lead to a deal, they said. 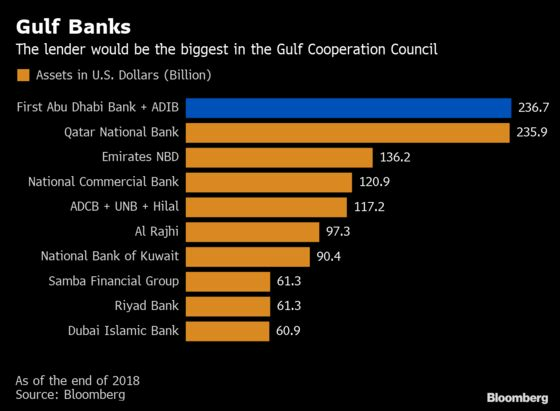 A merger would create a lender with $236.7 billion in assets, putting it just ahead of Qatar National Bank QPSC with $235.9 billion in its gas-rich neighboring rival, according to data compiled by Bloomberg. First Abu Dhabi Bank, known as FAB, on Thursday said it "currently has not entered discussions with ADIB to pursue any merger activity" and that it’s "fully focused on unlocking its full potential and maximizing shareholder value in 2019." On Wednesday, a representative of the bank had said the firm doesn’t comment on market speculation. ADIB said on Thursday it’s currently not studying a merger with other lenders after previously declining to comment. The firm in February said that it’s always studying options to strengthen its client base and market value after Bloomberg reported that it was weighing strategic options for its business. The shares of ADIB climbed as much as 5.5 percent, the most since November. They closed 2.5 percent higher, while those of FAB lost 0.1 percent. The likelihood of a deal is “high” and "merits are strong," Arqaam Capital Ltd. analysts Jaap Meijer and Janany Vamadeva wrote in a report. They see a base case scenario for the potential merger of 1 FAB share in return for 2.75 ADIB shares. Abu Dhabi, home to about 6 percent of global oil reserves, is stepping up efforts to create leaner and more competitive banks after a slump in crude prices. FAB was formed by merging National Bank of Abu Dhabi PJSC and First Gulf Bank PJSC in 2017, and the emirate has also combined three of its sovereign wealth funds. The consolidation isn’t unique to Abu Dhabi. Lower oil prices have pushed governments across the Gulf Arab region to consolidate their state industries in an attempt to stay competitive. Saudi Aramco last month agreed to buy a majority stake in Saudi Basic Industries Corp. from the kingdom’s sovereign wealth fund for $69.1 billion in a record deal for the region. Deals involving companies in the Middle East and Africa this year have jumped nearly 300 percent from the same period in 2018, according to data compiled by Bloomberg. Thanks to Aramco’s deal for Sabic, 2019 is on track to be the region’s biggest year for deals since at least 2007, the data show.